A Good Morning Britain guest has told viewers that the Black Lives Matter movement was started by “black lesbians and homosexuals” who were as bad as the Ku Klux Klan. 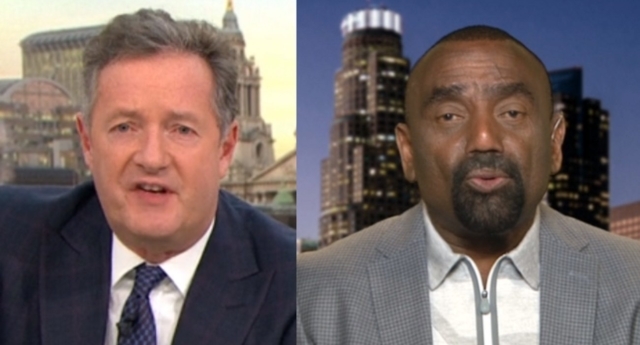 Piers Morgan and Susanna Reid cut off Jesse Lee Peterson’s microphone after he also claimed that the KKK, a white supremacist hate group, was “just like” BLM, a pro-equality organisation. Peterson, a right-wing radio host who regularly appears on Fox News, claimed in April that gay couples were not “mentally capable” of being parents. And he was back with more anti-gay rhetoric on Wednesday morning, during a GMB segment about Kanye West’s comments on slavery. He added that black people had it better under the discriminatory Jim Crow laws, which segregated black people in the US. Peterson said black people were “still enslaved” because “they think they are suffering due to this phony idea of racism. “We all know that there is no such thing as racism. Racism has never existed, it’s a lie that’s been made up by the liberals who are the children of the lie,” he said. Another GMB guest, actress and presenter Trisha Goddard, responded: “What is people putting on white hoods and burning crosses on front lawns, a firework display? “Let’s get real here, there is racism,” she continued. “There is racism not just between blacks and whites, but all through to blacks against other blacks. The KKK is, of course, a white supremacist organisation which has targeted minorities including LGBT people, and has dozens of branches defined as hate groups by the Southern Poverty Law Centre. After these offensive comments, Peterson’s microphone was cut off, as Morgan – who has himself made critical comments against non-binary people – told him: “You are now descending into completely unpleasant and frankly vile rhetoric. “We would get a response from him but we cut his microphone because he was spewing such unpleasant stuff,” he continued. After his appearance on the ITV show, Peterson tweeted: “Racism doesn’t exist. There is only love or hate, good or evil. It’s important to note that Morgan was fully aware of how inflammatory Peterson’s views were.